Cahaba River Society works to build our impact for the River through communication, and collaboration, and celebration. We believe that it takes many diverse partners working together to protect and restore a River. We encourage this by sharing the word about the Cahaba River, working collaboratively with all sorts of stakeholders, and celebrating our mutual victories. 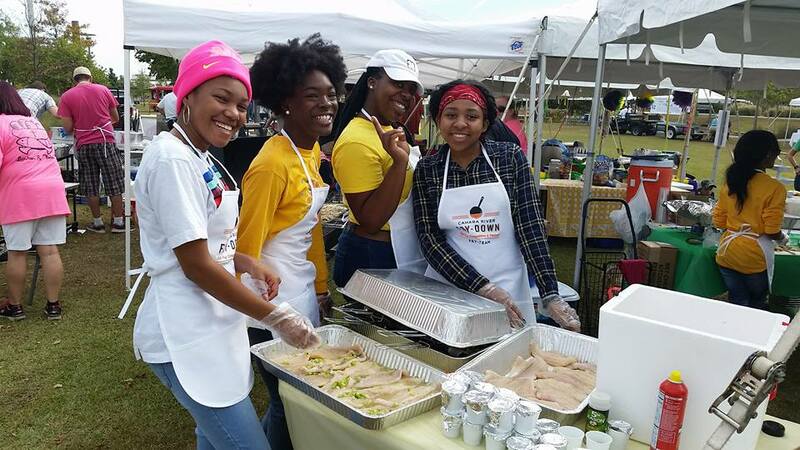 These Girl Scouts worked together to dish out catfish at the Cahaba River Fry-Down catfish-cooking competition and festival. Be a part of the movement to protect and restore the Cahaba River! Come have fun with Cahaba River Society, learn more and do good for the River at one of our many events throughout the year – Cahaba River Fry-Down, our guided canoe trips, our Annual Meeting, Earth Month Party, Headwaters programs, and more. Held eight educational and fun(d)raising events, reaching over 1,400 people in 2017. Hosted the 9th annual Cahaba River Fry-Down raising over $60,000 with support from more than 50 businesses and educational partners–thank you! Planned collaborative trainings with the Collaborative Environmental Network of Alabama to widen our circles for collaboration within and beyond our organizations. Increased national recognition for the Cahaba through participation in the Clean Water for All Coalition and through workshops on our education programs and stream restoration efforts presented at national conferences. Increased communications with our members to connect them to action opportunities and share stories of how people are making a difference for the River–check out our recent news items here, and subscribe to our Cahaba Current e-newsletter!